The genius of capitalism is that there is a link between effort and reward. In a genuine market economy (as opposed to cronyism), people can only make themselves rich by working harder and smarter to satisfy the needs and wants of others. The blunder of statism is that the link between effort and reward is damaged. Punitive tax rates, for instance, punish people for producing. Redistribution programs, meanwhile, create incentives for dependency. And regulation throws lots of sand in the gears of the economy, while also creating big opportunities for corrupt cronyism. I sometimes try to make this clear by citing the failure of communism. And by failure, I’m not talking about the brutality of Soviet-style dictatorships. Instead, I’m referring to the basic failure of state-controlled economies. Heck, places such as Cuba and Venezuela can’t even produce enough toilet paper! And North Korea is such a basket case that it reduced physical requirements for military service after pervasive famine led to a stunted generation. But I don’t want anyone to accuse me of red-baiting, so let’s pretend communism never existed and look at an unfortunate episode from American history. When the colonists created the Plymouth Colony, they used a socialist model. This video from Reason TV explains how that system foundered. Gee, what a surprise. Socialism was the problem and capitalism was the solution. When you give people property rights and establish a clear link between effort and reward, good things happen. As Bono now understands. More remarkable, even Obama once said we should “let the market work.” So maybe there’s hope. 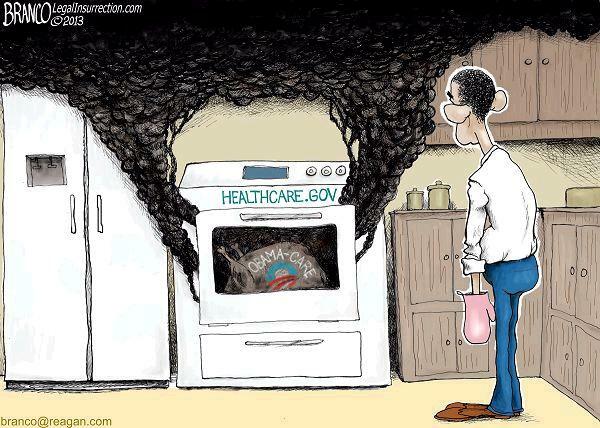 In honor of the season, let’s share a few more Thanksgiving cartoons, all of which – as you might expect – make fun of Obamacare. 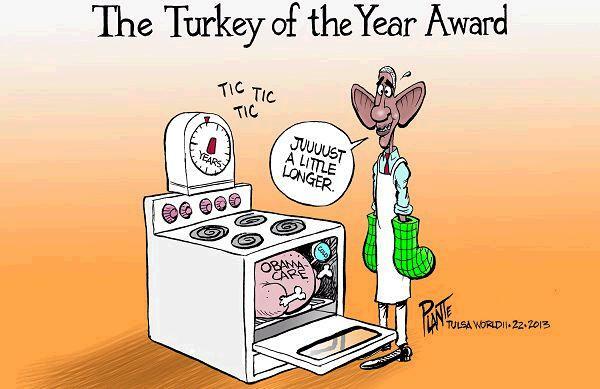 Continuing a theme from some of yesterday’s cartoons, we have the Turkey of the Year. And an observation on how well the law is working. 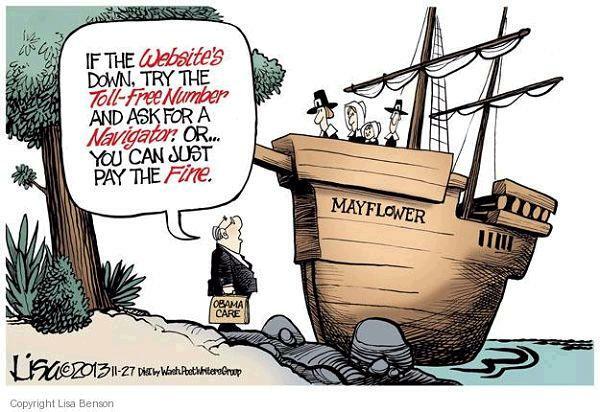 This Lisa Benson cartoon is very appropriate since the Mayflower carried the first colonists to Plymouth. P.S. I don’t want to pass up this opportunity for some well-deserved mockery of the evil philosophy of communism,. You can see some great Reagan jokes in the fourth video of this link and the first video in this link. And this doctored image makes a very powerful point in an amusing fashion. P.P.S. Back in 2010, I also debunked the leftist counter-argument in a post that included the Reason video and a John Stossel column on the topic of the Pilgrims and property rights. I am very glad the Pilgrims discovered that socialism did not work!!! ‘Even more remarkable, even Obama once said we should “let the market work.” So maybe there’s hope.’ You’re being sarcastic, I hope. If there’s one thing Obama has proven beyond any doubts, it’s how untrustworthy he is. His word is worth nothing.